This recipe was born of an accidental mix up of a legendary family recipe (I mixed it up because it was my husband’s family and I did not know better), but the mix up was so delightful that we have never done it right since! Here is the basic concept – chicken soup (with or without noodles), served right on top of a pile of smashed potatoes. Besides being delicious (first you’re just eating soup, then it gradually starts turning into more of a potato soup, then you are eating potatoes with a fabulous chicken gravy… you get the point), it is also exceedingly practical. This makes it possible to have chicken soup as a man’s man meal. Unless I am greatly mistaken about the nature of hearty foods for serious eaters, I don’t think that chicken soup was formerly allowed into that category! Anyway, this is a simple and successful way to feed people. It is pretty too, and with a baguette and maybe salad on the side, it makes for great comfort- company food. Â Try this out, and I’ll bet you that the children eat more than you knew they could!Â For the Soup: One chicken, with the gross bits inside carefully removed with your eyes closed. One large or two small onions, most of a head of celery, most of a bag of carrots.In a large stockpot, place your cleaned chicken and fill with water. Put it on the stove and let it boil until the chicken is cooked through and tender (test a leg to see how loose the joints are – you want it to be falling apart a bit). While the chicken is cooking, chop up your veggies to desired size. I do mine pretty small right now because of the babies, but otherwise I do the carrots in rounds.Remove the chicken to a bowl and set aside. Strain the broth through cheesecloth or paper towels, or a clean tea towel if you are desperate. I wash out the pot and put the broth right back in. Return to a boil. Dump in all your prepped veggies (put in chopped parsley if you have some fresh). Let simmer until the veggies are tender, or as long as you want to. If you want noodles, throw them in now.AddÂ chicken which you have shredded or cut (for the babies- cut, without babies – shred). Season with salt and pepper and let simmer until dinner. Add water if it cooks down too much. I cook rice in the leftovers and freeze it for baby food. (It’s the best baby food you ever tasted! )For the potatoes:Â 2 lbs. red potatoes (skin on); 4 oz. cream cheese; 4 Tbs. butter.Boil potatoes whole until tender when poked with a fork. When they are almost done, put cream cheese and butter in a saucepan to soften/melt. Drain the potatoes, reserving some of the water, then put them back into the pot. Let the skins dry, then dump in the cream cheese/butter mixture, along with 1/4 c. or so of the reserved potato water. Using a wooden spoon, smash them, stir them, adding a little more water if you need it until they are nice. Season with salt and pepper. Scoop a whollop of these onto the bottom of each bowl and ladle your soup on top. The first time I got to taste this, Rachel served it outside on a lovely, crisp fall evening. It is unforgettable! Whip this stuff up, ladies. You won’t regret it. I have been looking for a good chicken soup recipe! I tried your brownies and they were great so I can’t wait to try the soup. This is fabulous and a favorite of ours. I never made chicken noodle soup much until this recipe came from Rachel. I have to admit I will use chicken broth and chicken breasts, just chop them up after they have cooked. Thanks for sharing Rachel! It is delicious!! You ladies have great ideas! 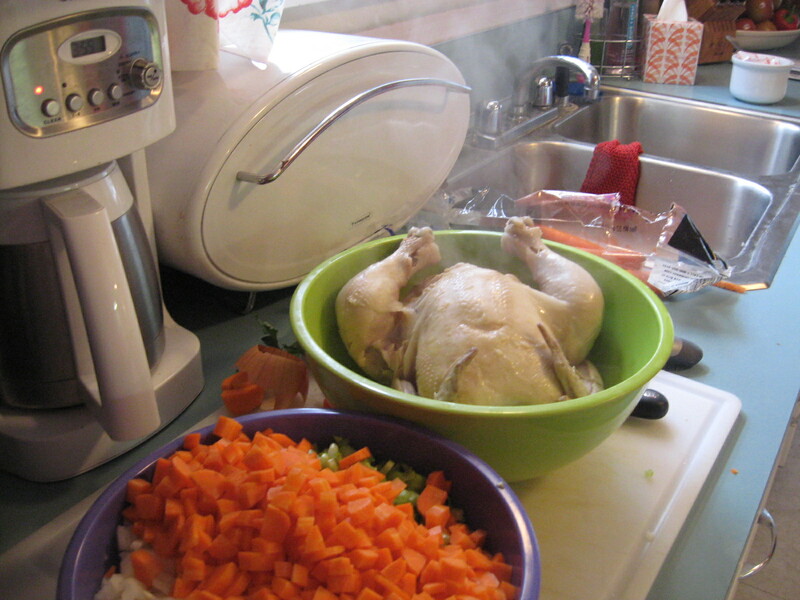 I have never thought of boiling a whole chicken; what a time saver (especially with the dishes). My family loves chicken soup and mashed potatoes, but have never enjoyed them together; this should be a big hit. This sounds fantastic and kind of easy too. In Ohio, this was a common dish. Our family always made our own egg noodles to go into it. I like to use my little pasta press to make the noodles. Once I get the dough ball made, my kids 13, 12, 10 and 8 (sometimes the 4 year old) all can crank the machine and make the noodles. The recipe is 1 lb. (about 3 3/4 c.) of flour, 5 eggs and 1 1/2 tsp. salt. The salt can be adjusted; I personally like the noodles saltier. Add some water if you need to; it won’t need much. In lieu of a pasta press, you can roll the dough thin and use a pizza cutter to make into noodles. These will be more toothsome than storebought noodles. You can dry them first, but I have thrown them in fresh. Be sure your broth is boiling when you put them in. They also freeze well. I loved the bread bin enough to look at the supersized image, and then search for typhoon. That is so fun. i’m hungry! what a great flub up! Soup, potatoes, noodles . . . delicious sounding recipes all! Many thanks! This does sound really good. I love using whole chickens (although I often cheat an use a store bought Rotisserie.) I can’t wait to try this. Thanks for sharing Rachel. My husband almost always refuses to eat soup as it “doesn’t fill him up.” I just read him this description and he’s now salivating – I think we’ll have to try it! I just made a similar “Farmhouse Chowder” from a MS Living magazine. Using a whole chicken to make the soup was so easy and great, it’s my new favorite way to make soup! Now, adding those mashed potatoes at the bottom may also make my husband a big fan of it as well! Thanks for the tip! Red potatoes for mashed potatoes is the best ever. Hey….I’m an ex fan of your delightful shop downtown. I enjoy peeking in on your blog from time to time to see what fun things you are creating. Chicken soup caught my eye…..my Russian grandma put a star anise or two in the pot with the chicken, onions and s@p. She also made her own egg noodles…..I use the kugli ones. It is delish. I should have said it in the original post that the “true” family recipe does have a sort of drop noodle/ dumpling thing cooked into it. I used to faithfully do those too, but they became less necessary once we were putting the whole thing over potatoes! The star anise sounds like a great addition! Nice to hear from you – hope you all are well! I’m glad you all like the recipe – say hi to Sarah for me! I’ve been thinking of you all a lot – looking forward to seeing you pretty soon! That does sound lovely. /wanders away wondering if I could use this to justify buying a bigger pot.